Arthurwears: Buying Toddler Toys: Age, Ability or Interest? Choosing toys for your little one (or someone else's little one!) can be a bit of a minefield sometimes. As a parent, you usually have a pretty good idea of the kind of things your child is interested in, but it isn't always easy to find something that is also suitable for their age - especially with regards to younger children and babies. If you are also interested in child development (like me!) and can't help but plan for your child's 'next steps' in learning - it can get even trickier...especially if some areas and stages of development are hit earlier than average in terms of age, but all of the 'toys' and activities you think could help build on their skills are marketed at children much older - usually for health and safety reasons. Still, I can't help but think that with regards to some toys - it's okay to have a discretionary judgement call from the parents/carers, especially if you know that you will be supervising your child in any case, and you are pretty sure (from common sense) that the toy in question isn't going to cause harm. After all, every child is different. We all develop at different rates and we all have different interests...shouldn't we be able to take that knowledge of our children and make those choices as we see fit? 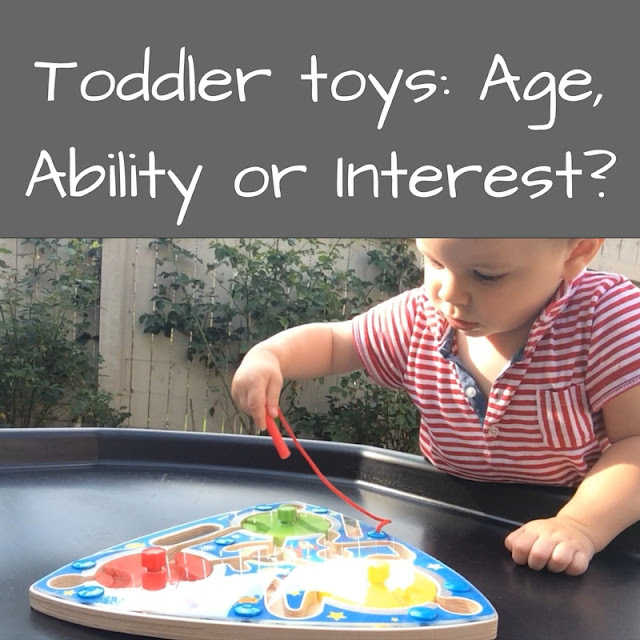 So, my question is: Should we buy our children toys based on age, ability or interest? Am I only looking at older age groups because I just haven't come across interesting, exciting or developmentally appropriate toys for his actual age?? We decided to take The Wicked Uncle Challenge and find out! Wicked Uncle say that they are the home of brilliant children's presents, with lots of "interesting, fun and unusual presents". Looking at their website, I have to agree! There are so many amazing toys and activities on there, I only wish they had a 'wish list' facility because there are some brilliant presents that I would LOVE for myself in their 'cool stuff for older children' (we all know that's me!) section. The great thing is that you can choose via age (yes, all toys are based on health and safety age guidelines where given), category - which is just another way of searching via your child's interest, popularity and for those of us who don't buy into the gender stereotyping ( and those of us who do) you can choose to search for boy/girl/all. What do you take into consideration when buying toys for toddlers? Would you ever buy a toy meant for an older child? Under what circumstances? I'd love to know what you think - please leave me a comment below on your experiences! Absolutely! He loves them! The John Deere set is perfect as he is mad about vehicles at the moment and the magnetic maze is a perfect level of challenge - possibly some of it is a bit tricky but that's great because he will be able to use it for a long time before he gets bored of it, plus it is really good for his fine motor skills too. To be honest there wasn't much on the website that I thought he wouldn't like to be honest! I have definitely bought presents with an older age range before if I know it is something that one of mine will really love. I think as long as you are very aware of small parts and supervise then it's fine. Thanks so much for linking with #KCACOLS. We hope you come back next time.